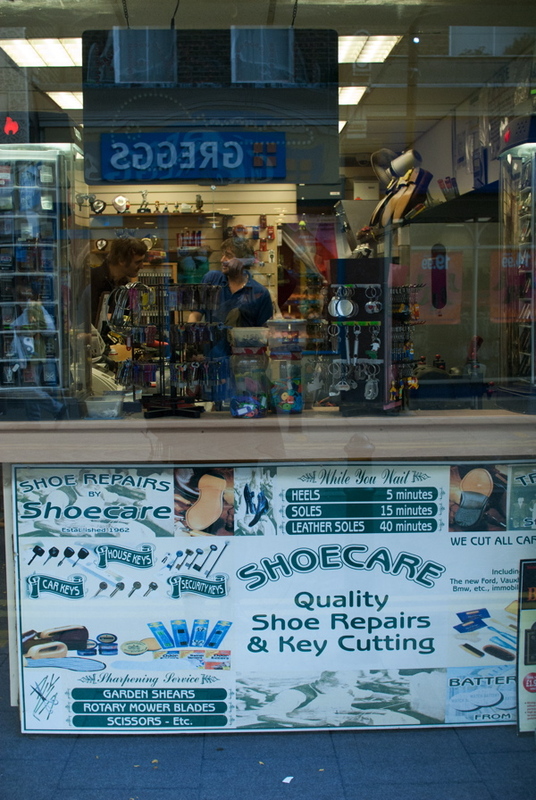 Shoe repairmen have long been my heroes, the last craftsmen on the high street – where you can still walk into a workshop, inhale the intoxicating fragrance of glue and watch them work their magic on your worn out shoes. Even better than new shoes, there is something endearing about old shoes beautifully repaired. 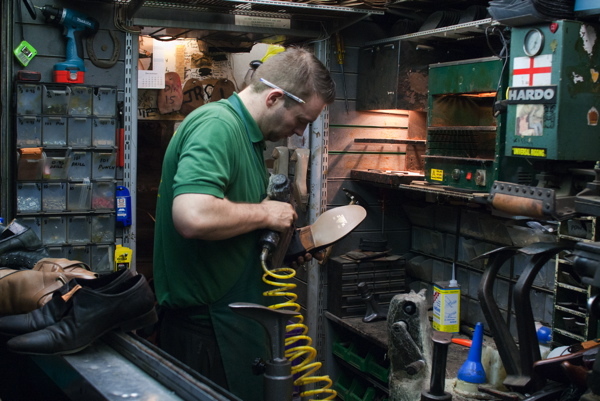 And so, in the heartfelt belief that – although it is commonplace – the modest art of shoe repair should not be underestimated, I persuaded Contributing Photographer Sarah Ainslie to accompany me on a sentimental pilgrimage to pay homage to some of my favourite East End cobblers. When the crash happened in the City, news crews descended upon Gary at Shoe Key in Liverpool St to learn the true state of affairs from the authority. 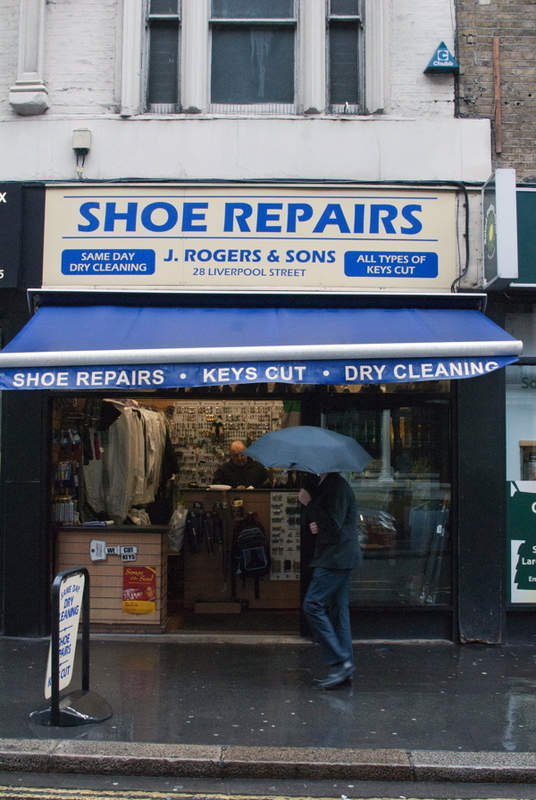 They wanted to know if city gents were getting more repairs rather than buying new shoes, or if the crisis was so deep that they could not even afford to mend the holes in their soles. Yet Gary dismissed such scaremongering, taking the global banking crisis in his stride. “There was a slump in the winter of 2008, but since July 2009 business has been steady,” he informed me with a phlegmatic understatement that his City clients would appreciate. Seventeen years ago, Gary built this narrow bar at the entrance to the Liverpool St Arcade where he and his colleague Mike Holding work fifty-four hours a week, mending shoes with all the flamboyant theatrics of cocktail waiters. They felt the blast of the Aldgate bomb here in 2005 and each winter they suffer the snow landing upon their backs, so three weeks ago they hung up a new tarpaulin to afford themselves some shelter from the future whims of fortune. 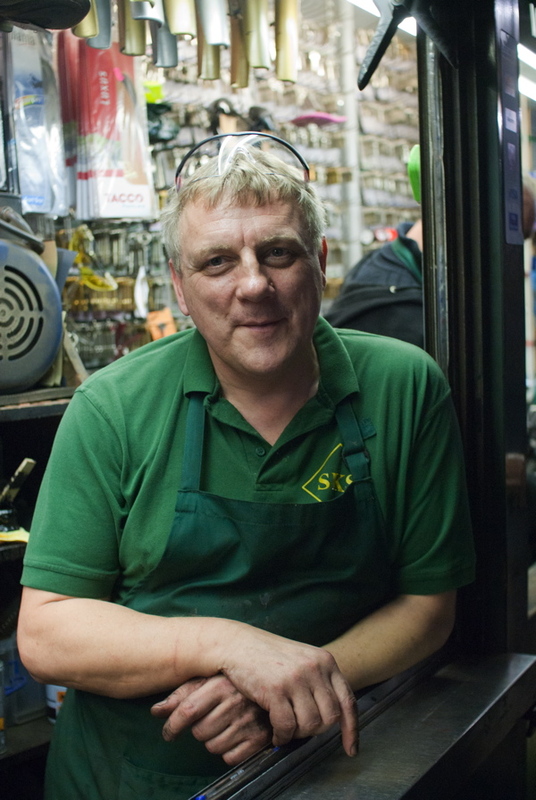 Round the corner from Shoe Key, I visited Dave Williams, a gentleman with time for everyone, comfortable in his enclosed booth in Liverpool St directly opposite the station. 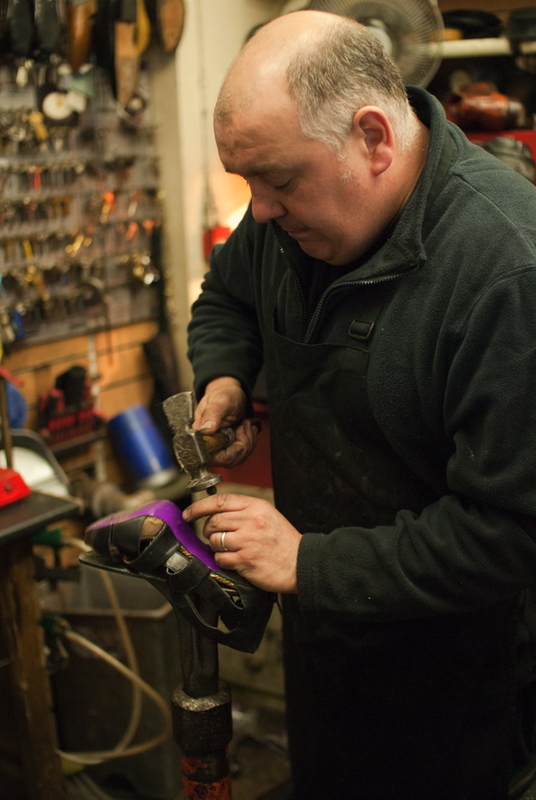 Dave told me he was the third generation in his trade,“My grandfather Henry Alexander and my father Norman were both saddlers and harness makers, my father he’s a Freeman of the City of London now. They were from an Irish immigrant family in Stepney. In those days, if people had trouble with their boots they took them along to the harness maker and gradually the trade in repairs took over. My training was at my father’s knee. I left school at sixteen and I have been doing this twenty-seven years. I think this trade is pretty much recession proof. It’s always been a good trade and I do very well thankyou.” In contrast to Gary at Shoe Key, Dave was full of self-deprecatory humour. Passing bags of shoes over to a couple of girls, “That’s two satisfied customers this year!” he declared to me with a cheeky smirk, the ceaseless repartee of a man who is sole trader and star turn in his own personal shoe repair theatre. Over in Camomile St, at the base of the tall Heron Tower, Kiri and George, the energetic double act at Michael’s Shoe Care, enjoy the privilege of having a door on their neat little shop, where everything is arranged with exquisite precision. 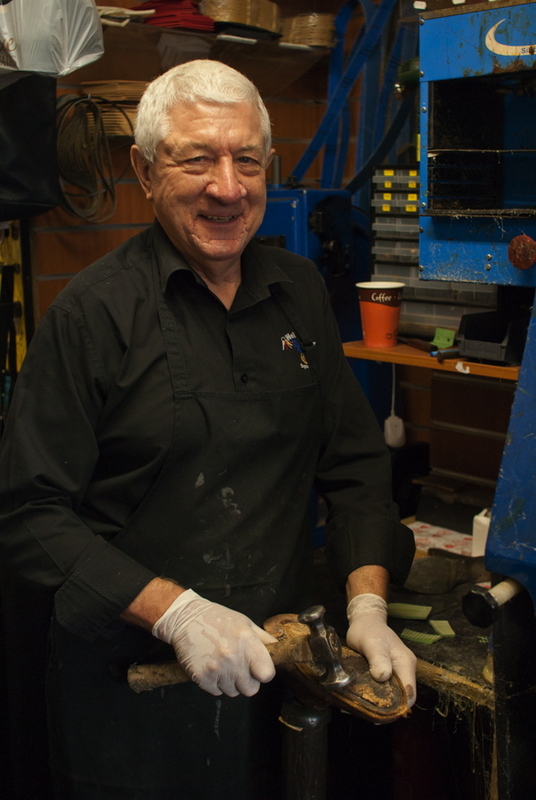 The additional service at Michael’s Shoe Care is the engraving of trophies, cups, plaques and statuettes which – as George explained to me enthusiastically – are in big demand now that corporate life has become increasingly about hitting targets and setting employees in competition against each other. George, who has been here twenty years, leaned across with eyes gleaming in anticipation and confided his hopes to me, “A lot of places closed down round here recently and thousands of people were moved out, but the new build opposite will be complete next year with a lot of new office space to rent. It’s just a question of waiting and more people will come to us.” I glanced up at the gleaming tower above, and thought of all the engraved trophies that are going to be required to reward all the corporate striving upon its forty-seven floors. Yet in spite of the pathos of this bizarre appropriation of sports day trophies, I was happy in the knowledge that Kiri & George will be secure in their jobs for years to come. 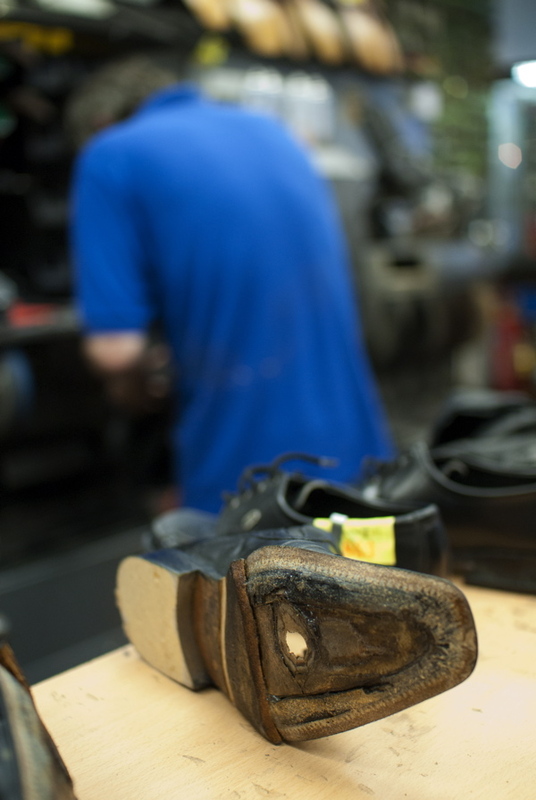 At the end of our pilgrimage we had worn out plenty of shoe leather, yet it had been more than worth it to encounter all these celebrated cobblers, and be party to some of the unique insights into human life and society which shoe repair brings. It is a profession that affords opportunity for contemplation as well as the engaged observation of humanity, which may explain why each cobbler I met was both a poet and a showman to a different degree. I admired them all for their independence of spirit and ingenious talent, devoted to the mundane yet essential task of putting us back on our feet when we come unstuck and our soles wear thin. 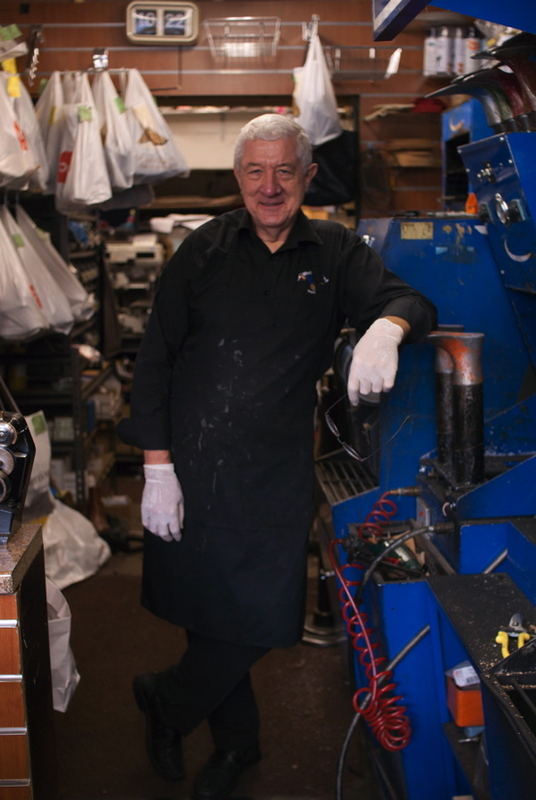 David Williams at Liverpool St Shoe Repair, third generation from a family of saddlers. In the Arcade, Liverpool St Station, with the new tarpaulin fitted ready for the Winter. Mike Harding at Shoe Key. 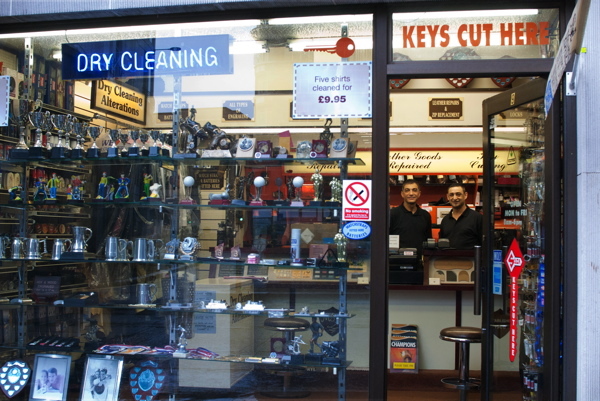 Michael’s Shoe Care in Camomile St sells trophies given as rewards for hitting corporate targets. 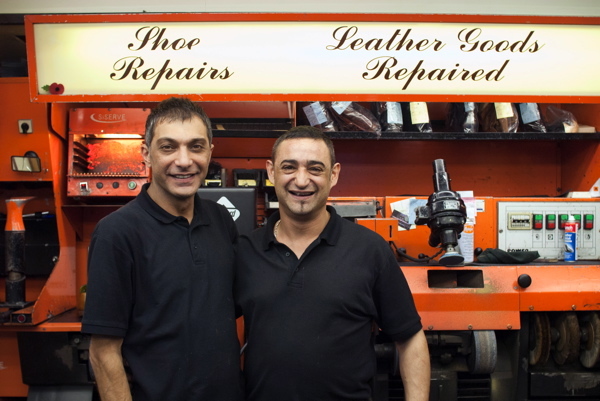 Kiri & George are a mean shoe repair team. “It’s total football,“ says Kiri. Old Charlie’s hammer, “It was eighty years old when he gave it to me thirty five years ago.” said Ken. 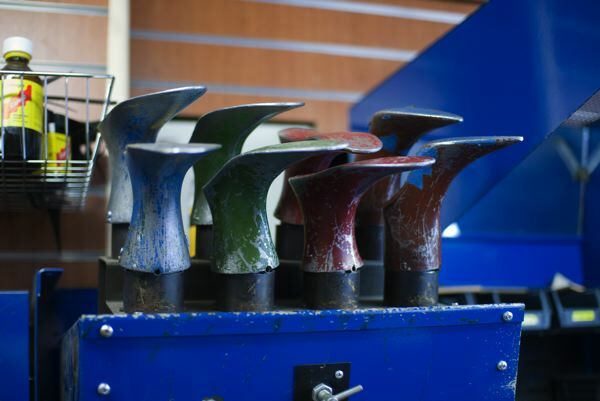 For me, the smell of the shoe menders shop evokes memories of childhood. 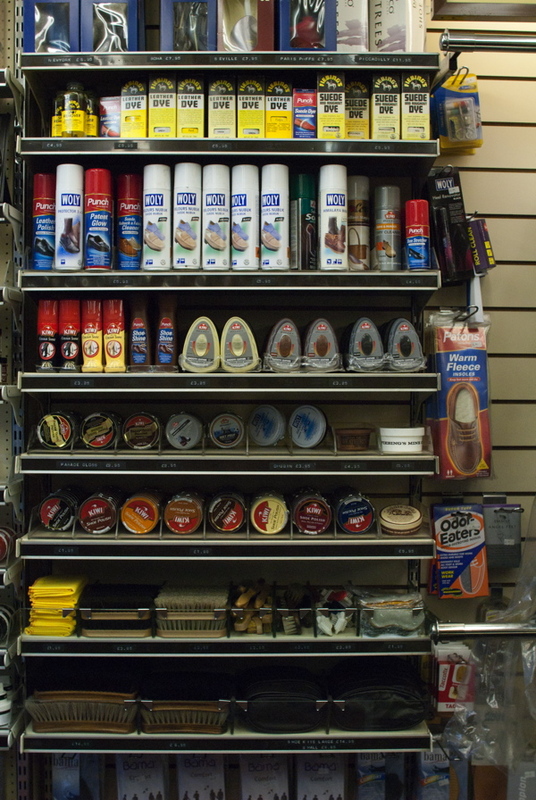 We always used to take our shoes to be repaired and I loved the smell of leather and adhesive all mixed up. 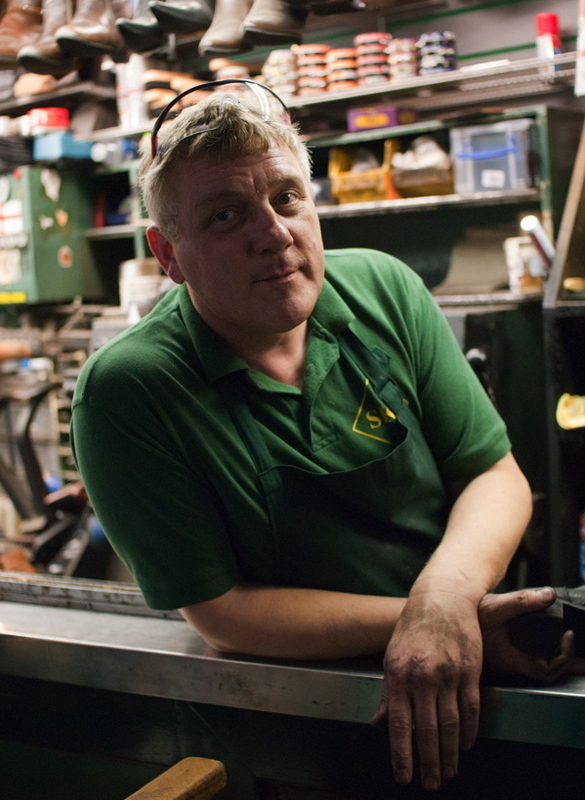 I really enjoyed reading this, so nice to know that there are still cobblers around providing this valuable service. I almost look forward to taking my shoes to the cobbler’s – it has to be one of my favourite place. 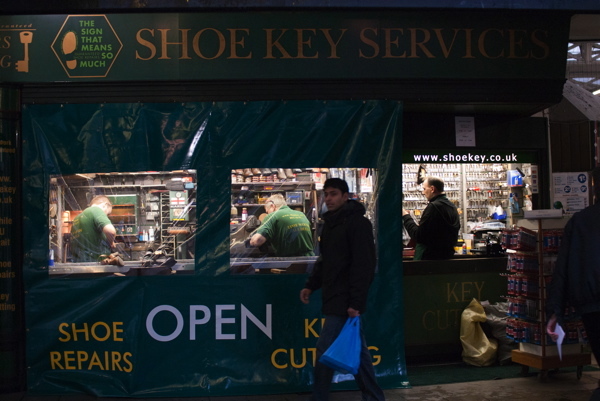 My local cobbler is in Chiswick and I think of their shop as ‘my cobblers’. Does anyone remember a particular cobbler’s shop in Whitechapel Road in the 1940/50s. It was close to Black Lion Yard and was well set back from the road. It had a very large window set at a right-angle to the road and the cobblers worked on their lasts very close to this window. Kids (and adults) could stand and watch the men at work behind the window but just about 3 feet away. I was one of those kids. Were you? The cobblers always had a mouth full of nails. Good luck to russell grimes…keep us posted on your job search mate. 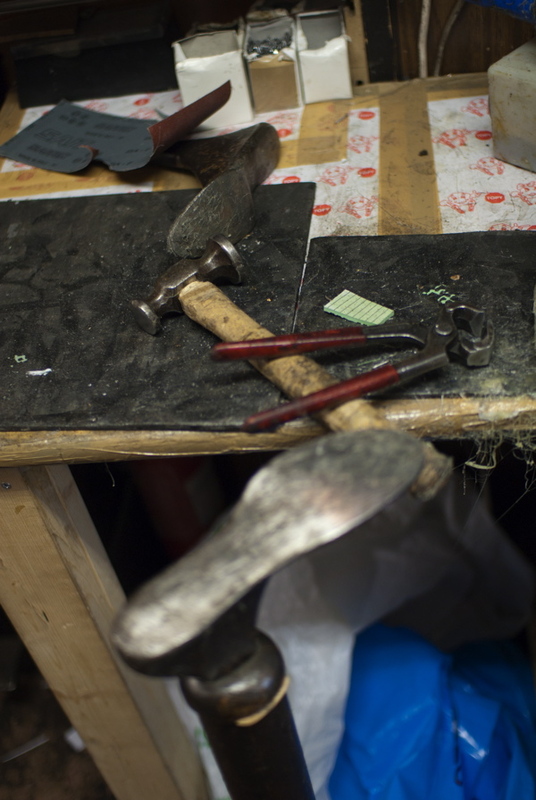 My great-grandfather Jacob Freedman was a cobbler, actually a slipper maker, who came from Poland to Spitalfields about 1882. He lived in Dorset Street where my grandfather Myer Freedman was born in 1886 and then moved to Ellen Street. There were many Jewish cobblers in that area until the late 1880’s when shoe manufacturing became mechanised. Many left for America including Jacob Freedman. By 1890 he has established there in Brooklyn and sent for his wife and children. But a fire in the building put him hospital where he died three days later on December 19, 1890. His wife and children remained in London where she worked the markets until her death aged 88 in 1943. She never remarried, lost two the kids young, leaving a daughter in London and my grandfather who settled in Australia in 1921. I lived in a big rented house in Wembley when I was a teenager. It had a cottage next to it that used to be the carriage house. It was the home of Mr. Rolfe (cobbler) and his three sons. Mr. Rolfe’s workbench fascinated me. It was surrounded by metal lasts and piles of leather cut-outs. He was very patient and hardworking and had many customers. Too bad that his home, and ours, was pulled down to make way for a parade of shops, none of which included a shoe shop, let alone a cobbler.